Before you read further, just a warning – the following pictures can get quite eerie especially in the current 7th lunar month – the Chinese Hungry Ghost Festival. 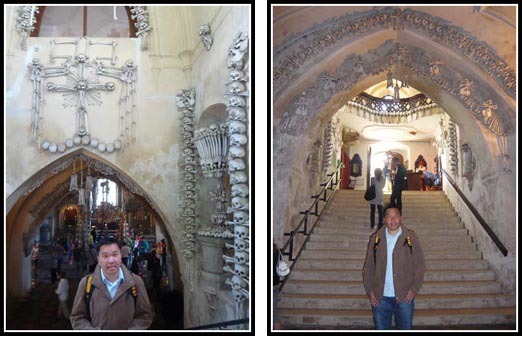 Kutna Hora is located about 1.5 hours by train away from Prague. 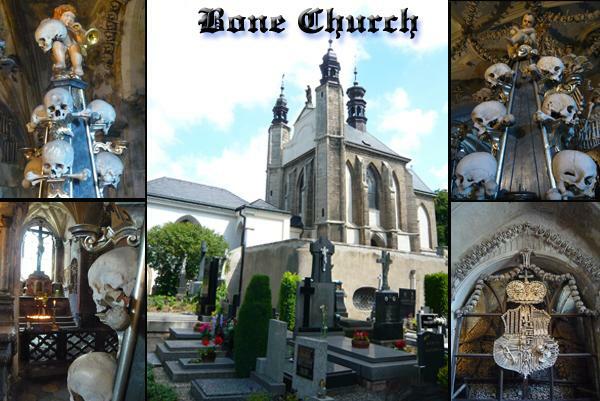 One of its most famous tourist attraction is the remarkable ‘bone church’ of the Sedlec Ossuary. It is located about 800m south of Kutna Hora main train station (Follow the crowd once you get off the train). In 1278, the Sedlec monastery abbot, Henry was sent to the Holy Land by King Otakar II of Bohemia. When he returned, he brought with him a small amount of earth he had removed from Golgotha (biblical name for the place where Jesus was crucified; most probably a small hill just outside the walls of ancient Jerusalem) and sprinkled it over the abbey cemetery. Word soon spread of his act and the cemetery in Sedlec had became a popular and desirable burial ground throughout Central Europe. The Black Death in the 14th century and Hussite Wars in the 15th century brought about thousands more burials in the cemetery. Around 1510, the skeletons (bones from over 40,000 people) were exhumed and the bones stacked in a chapel of the Gothic church built in the centre of the cemetery, to make space for new burials. 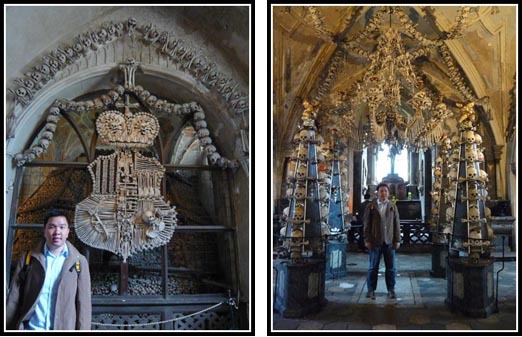 In 1870, František Rint, a woodcarver, was employed by the Schwarzenberg family to put the bone heaps into order. The macabre result of his effort speaks for itself. Other works include piers and monstrances flanking the altar and the signature of Rint, also executed in bone, on the wall near the entrance. Admission to the Bone Church cost 50Kc for adult. Note that there are no additional charges for taking photos (they used to do so – older guidebooks might make reference to that). The chapel where these bone “decorations” are displayed is very small (about the size of half a football field) but the contents are so fascinating that it took us about an hour to explore. 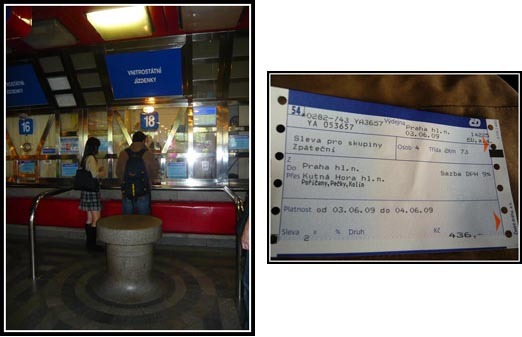 Proceed to Hlavni Nadrazi (Prague Main Train Station) to purchase tickets (Look for “Jizdenky” – it means tickets). 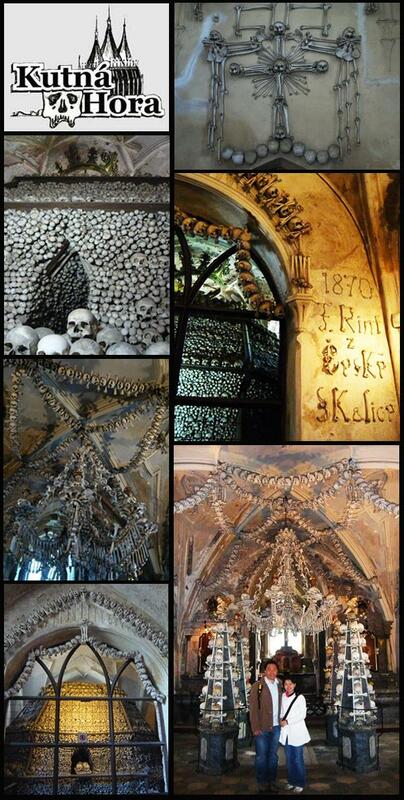 Most counter staff don’t speak English so just write down ‘Kutna Hora” on a piece of paper and signal with your hands that you want a return ticket (you wouldnt want to spend a night in the Bone Church :-)). Your ticket is valid for the entire day so you can take any of the trains to and from Kutna Hora. .-= wayangtimes´s last blog ..Very Funny Video Commentaries on the Singapore Guy Who Got Stomped by His Girl in the Face and Groin =-. p/s: My email add is also my msn add. Just got back from Kutna Hora today. Great directions! Thank you! preferred artificial Christmas tree for you.